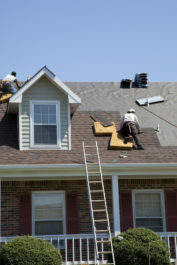 A home roof replacement project can be a stressful process, which is why it’s important that you hire a contractor that will stand behind its work. At Daech & Bauer Roofing, we offer unmatched guarantees – including a five-year labor warranty – so our customers will know that their investments in their homes are protected. We’ve completed more than 10,000 projects in the Collinsville, Illinois area to date, and our focus on customer satisfaction helped us to be named a Top 100 Roofing Contractor in the U.S. by Roofing Contractor magazine. Daech & Bauer also has extensive experience with insurance claims. If your roof has been damaged in a storm, our representatives can help you navigate the tricky claims process to make sure you receive the compensation you deserve. If you would like to learn more about the home roof replacement services we offer for residents of the Collinsville, IL area, contact Daech & Bauer Roofing today.